The trend continues - I still don't feel like cooking. And right now, I don't feel very talkative either, so will cut right to the chase, so to speak. The first time I had this dish, was when gran mom was visiting, and she made it. I remember our dogs sitting around the table & begging for pieces, while I cut up the bread - cute dogs they are too! Hmmm, those were the carefree days of youth - no responsibilities, no family to care for, someone else to take care of the basic necessities - like cooking. Nostalgia - okie this is going nowhere, didn't I say I wasn't feeling very talkative? Gosh! I wish I am back home.... Alright, that's enough, get on with it now! 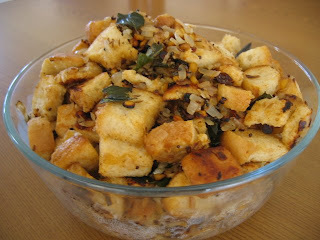 Well, it was all that reminiscing that made me prompted me to make bread upma - so just sharing my thoughts with you all. Keep stirring till the bread pieces become a nice golden brown. I started making this in a large deep skillet & then it was difficult to toss the bread, so transferred to a wok. Take care not to use too much water, else the bread gets soggy / soft. The sourdough gives a very nice flavour to this bread.